Teen who escaped Jerusalem fire helps police locate arson suspect, then tells the story of his escape. A teenager up late talking to his friends may have seen the arson suspect just before he lit a Jerusalem motel on fire, Walla! reported. 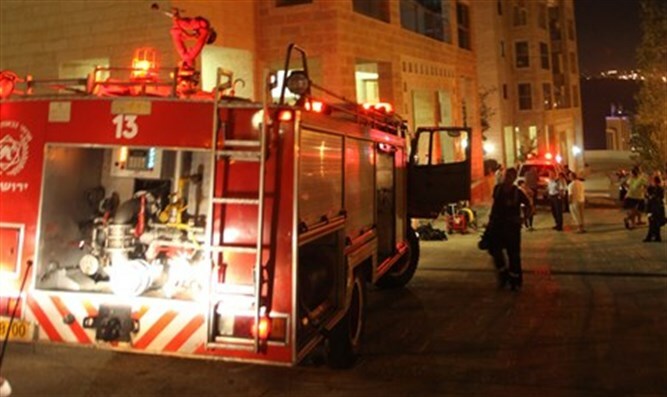 Joel, a sixteen-year-old boy from Holland who escaped the fire raging in a Jerusalem motel Thursday night, told Walla! the story of his escape. "I was sitting in the building, talking with friends in Holland," Joel told Walla! "And then at 1:30a.m. I finished the conversation and went to my room to sleep. In the hall, I saw a very big man. I thought he was going to rob me, but nothing happened and I went to the room to sleep." Afterwards, Joel heard a noise, opened the door, and saw "a huge fire" in the hall. "I told my mother and sister to get out, and they climbed out the window. We were on the ground floor. I tried to find something to put the fire out with, but I understood I didn't have time. I took my tefillin (phylacteries - ed.) and I went outside." Joel also told Walla! that he was interrogated by Israel Police. "They took me to the police station, and I described the man I had seen. He was muscular and tall. They showed me a photo and I identified him." When asked about the four who were seriously injured, Joel said, "I didn't know that there were people with us on the same floor."